Leopard Anatomy, habitat, distribution, feeding, reproduction, evolution, social structure, conservation. Leopard images, videos and top facts. For millions of years large cats have been part of the Earth. There is a great deal of debate over the past for the Leopard. What happened in regards to them through evolution remains a mystery. While we do have some good ideas and fossils to evaluate we can’t say with any certainty what all has occurred with these amazing animals over the course of time. Today we have identified 11 subspecies. The Leopard belongs to the category of big cats – and it is the smallest in that group. This category also includes the Lion, Tiger, Snow Leopard and Jaguar. The body of this animal is very long and very strong. They have short legs when you compare them to other felines, but they make up for it with speed and power. They can run up to 36 miles per hour for short periods of time. Due to the way that they look they are often mistake with the Jaguar. The physical appearance of the Leopard is fascinating. They have a large head and very sharp teeth. They also have small round ears that offer them exceptional hearing. The fur is a light brown with some gold and reddish tint to it. They also have dark black rosettes on their fur. The look of it is why these animals were so heavily hunted a few decades ago. People wanted to wear clothing made from this type of fur, especially fancy coats. The Leopard ranges in size from 65 to 200 pounds. The males are an average of 30 pounds heavier than the females. The overall size of these animals often varies depending on their habitat location. It is believed that the size of a male helps to determine if a female will mate with it or not. The size also helps it to have the best territory as other males won’t engage in battle with it. They are very good hunters, often lurking in the shadows as they wait for their opportunity. They can take down prey that is two times larger than they are. However, they also consume lots of small animals including rodents and reptiles. Deer and antelope make up a high percentage of the larger kills they make. The legs of the Leopard are much shorter than those of other felines. 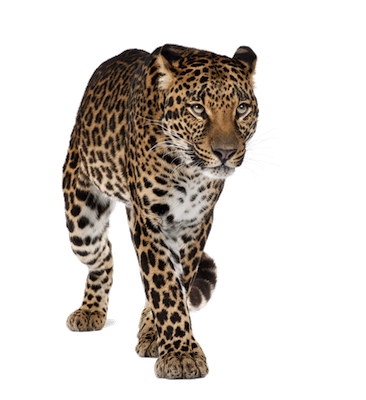 The Leopard can run up to 36 miles per hour for short periods of time. Mating can occur during any time of the year for the Leopard. Once a female has conceived the young will arrive about 90 to 100 days later. The young are called cubs and there can be up to four of them born at a time. The mothers find a cave or other hidden area where they can protect their young. The mortality rate is about 50%. Those that survive will remain with their mother for 1 ½ to 2 years. The habitat where the Leopard roams continue to get smaller and smaller. Humans are responsible for that due to their own activities in such areas. The places where you can find the Leopard still living in the wild include Asia, Africa, and Siberia. There are very few of them that still remain in areas of China and Malaysia. The Leopard is classified as near threatened. Many experts believe that the conservation efforts in place right now will help them to be able to repopulate. Such programs do take time though so we need to be patient. The fact that they aren’t going to continue to drop in numbers with good programs out there though is very encouraging. Humans often have a bad impression of the Leopard though so it can be hard to convince some of them to take action to protect this animal. Under the right conditions the Leopard is able to live for about 11 years in the wild. In captivity that can increase to around 20 years.